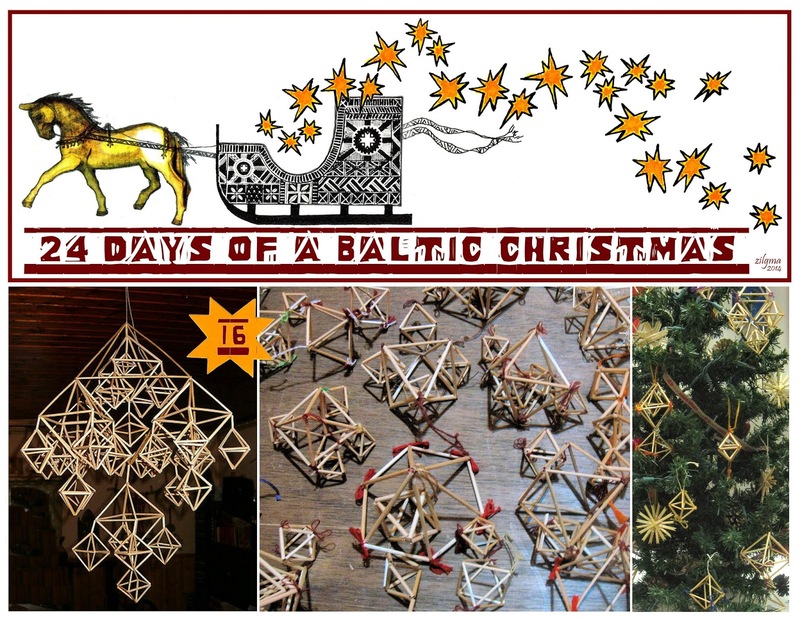 For Day Sixteen of 24 Days of a Baltic Christmas we welcome back Inga on the topic of puzuri! Puzuri and ķisti are among some of the oldest known Winter Solstice decorations that ancient Balts made – and not only for Christmas, but for other special life events, such as weddings, and to bring blessing and grace to a home. They are believed to be a symbol of "wholeness", and their constant slow movement when hanging scares away or traps evil spirits. As with Native American dream catchers, they should be aired every so often, and burned in the New Year's bonfire to guarantee an evil-free year. In different areas of Latvia, they are also called lukturi, krīģi, spurguļi; and other Scandinavian and Northern European countries call them himmeli – from both Swedish and German himmel (sky, heaven). A single puzuris is made of twelve segments, possibly representing the twelve months of the year, and is a wonderfully simple Christmas tree decoration. To create a mobile hanging, puzuri of different sizes may be combined by connecting corners, the end result limited only by your imagination! Hanging from the ceiling, the mobile spins and twirls with the slightest draft from opening a door, walking by, warmth from candles, magically creating interesting geometric patterned shadows. 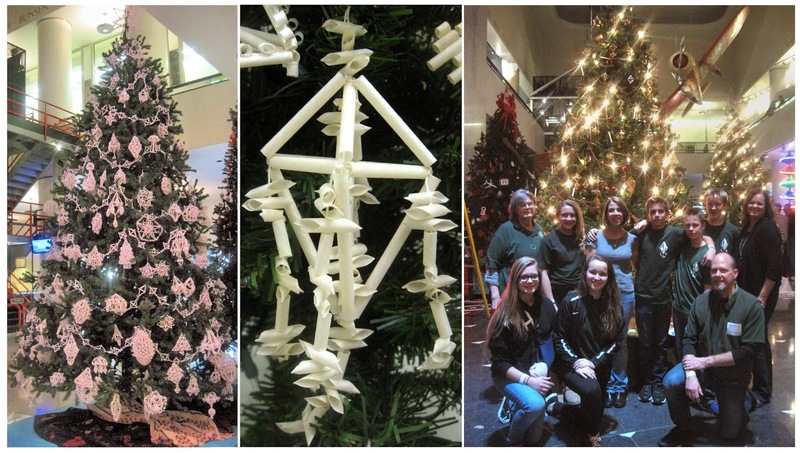 The Lithuanian tree at the Museum of Science and Industry; a detail of a Lithuanian puzuris; the Chicago Latvian girl guide and boy scout volunteers with the Latvian tree at the museum. Traditionally, puzuri were made of rye straw or reeds by grandmothers with their grandchildren. The straw must be hollow to allow threading. The straw or reeds were gathered in the fall, carefully laid out to dry, then peeled of the papery outer layer, any knots or ugly spots cut out. Straws must then be cut into segments, length determined by the size of puzurs you are making. I find straws very difficult to cut without damaging, and after trying every implement from embroidery scissors to box cutters to single edge razor blades, I found that soaking the straws overnight makes them stronger and less prone to split. After soaking, I was able to cut them with a sharp pair of small scissors with little loss. Inherently fragile, working with straw requires patience and a steady hand. Beginner puzuri-makers may use paper or plastic straws (like those tiny coffee stirrers? ), as these will be sturdier and less apt to split or bend, and paper or plastic straw is easier to find than natural straw. Colored thread or yarn, feathers, twists or cut-outs of paper, even bits of eggshell are used as embellishment – there are no rules, other than to use what you have at hand! 1) Thread three straws, knot. 2) Add two more straws, secure at corner. 3) Add two more, secure again. 4) Add two more straws, secure at corner. 5) Add one straw, secure at corner as shown – puzuris starts becoming three-dimensional! 6) Secure the corner – one half of your puzuris is complete. 7) Thread one more straw and secure as shown. 8) Add the final straw as shown, and knot the end to the beginning! There are many other decorations that can be made with straw, but the easiest might be a chain to hang over a doorway, or around your tree by threading straws alternating with cut paper (or birch-bark, if you happen to have some handy) shapes – as long or short as you like. Another type of chain – simply keep adding triangles! These are super cool, we're going to try to make them! I bet pasta would be an interesting variation on the theme! Plus - you could paint them! dazzling and vibrant fotografia !